Exclzyme®EN is an exclusive formula of systemic enzymes that work synergistically; only the high quality enzymes mostly of herbal origin are used, the formula has high enzyme activity - 30,000 EU. The product has been manufactured using high quality pure raw materials and the technology that ensures all their beneficial properties intact, in strict compliance with GMP and TÜV regulations. If you were to ask someone what enzymes are, and how they work, most people wouldn’t be able to give a correct answer, however we can not exist without enzymes. Enzymes are complex protein substances that participate in every chemical reaction in every cell of our body. They are essential for all metabolic, reproductive, and defensive processes inside our body. Enzymes play a great role as biocatalysts – they speed up chemical reactions. Without enzymes the chemical reactions that make up our life would be too slow for life as we know it. Millions of chemical processes in our body are taking place every second – and without enzymes these processes would’ve taken hundreds of years. More than 3000 enzymes provide normal vital functions in our body – most of them are proteolytic (protein-splitting). They are produced by our body or enter with the food we eat – fresh, not thermally processed. The enzyme is highly specific in its action. Enzymes work like a key and a lock - just as a key only works for one specifically programmed lock, an enzyme is programmed for one specific function. This enzyme only works with one particular chemical, and interacts with that chemical only. The human body contains a huge number of different enzymes working like clocks, providing an unlimited number of vital complicated processes. To sustain all normal vital functions a human body needs to have an adequate number of enzymes. Nowadays almost everyone suffers from enzyme’s deficiency as a consequence of eating thermally processed food. Enzyme deficiency can happen because of genetic changes, and can cause serious health problems. Medical scientists predict the big future in the development of new methods of enzyme therapy in maintaining good health and well-being, and disease prevention. Exclzyme®EN – is Santegra®’s exclusive systemic enzyme formula. • Exclzyme®EN has high enzymatic activity – 30,000 ExcIU per one tablet. • Enzymes in Exclzyme®EN act synergetically – the phenomenon in which two or more agents acting together to create an effect greater than the predicted by the separate effects of the individual agents. Peptizyme SP® EN – Serrapeptase – proteolytic enzyme produced in silkworm’s stomach. Silkworms use it to dissolve cocoons in their transmutation into a butterfly. Clinical trials proved fibrinolytic, anti-inflammatory, and anti-edematous effect of Serrapeptase. This enzyme has an ability to clean up dead tissue, grume, and arterial thrombus. Considering these anti-inflammatory and pain relieving properties Serrapeptase is widely used as an alternative to non-steroid anti-inflammatory products. Peptizyme SP® EN is the only enzyme in Exclzyme®EN, that is sensitive to the acidic environment of the stomach, and therefore it is protected by a special coat, that dissolves only in the small intestine where absorption takes place. After the enzymes are absorbed in the blood stream, they spread out throughout the body, wherever they are the most needed. Bromelain is a proteolytic enzyme extracted from the flesh and stem of the pineapple plant, Ananas comosus. Bromelain is most notable for its effectiveness in the reduction of inflammation and decreasing swelling. As a natural anti-inflammatory, it is widely used to reduce arthritic pain and edema. Bromelain may also be helpful for the pain, numbness, tingling, aching, and loss of motor and sensory function in the fingers resulting from carpal tunnel syndrome (CTS) (8, 9), and for prophylaxis of thrombosis (clot formations). (10) Even a small dose of bromelain is beneficial for cardio-vascular support, improves digestion, has a positive effect on metabolic functions, and helps with excessive weight reduction. Papain is one of the proteolytic enzymes found in milk juice of papaya tree (Carica papaya L.). Papain is a broad-spectrum enzyme that has a special function of splitting proteins into amino acids. • may help lose excess weight. Amla (Emblica, Indian gooseberry) – one of the most celebrated herbs in the traditional Indian medicine. Amla is well known as the richest source of Vitamin C, which is resistant to storage and heat damage due to cooking. Besides that, amla contains bioflavonoids and carotenoids with antioxidant properties. Amla improves immune protection and hemoglobin synthesis. The chemicals in this plant’s fruits have a unique ability to support enzyme activity. Rutin – bioflavonoid, with antioxidant and anti-inflammatory properties, decreases the capillary wall permeability, increases its density. The efficiency of enzymotherapy is confirmed by clinical researches in more than 20 different areas of medicine, including obstetrics-gynecology, urology, surgery, etc. Exclzyme®EN helps body to support well being the natural way, without negative effect of antibiotics, hormones, and other chemical substances. * Exclzyme®EN and Peptizyme SP® EN – are registered trade marks of Specialty Enzymes and Biochemicals Co.
Peptizyme SP®EN, protease, papain, bromeline, amylase, lipase, rutin, amla (Emblica Officinalis). As a dietary supplement take 1-2 tablets twice a day with a glass of water. Take between meals as a systemic enzyme, and with meals as a digestive enzyme. Hans A. Nieper, M.D., an internist from Hannover, Germany, studied the effects of Serrapeptase on plaque accumulations in the arteries. The formation of plaque involves deposits of fatty substances, cholesterol, cellular waste products, calcium and fibrin (a clotting material in the blood) on the inner lining of the arteries. Excessive plaque results in partial or complete blockage of the blood’s flow through an artery, resulting in arteriosclerosis, and potentially a stroke or heart attack. According to Dr. Nieper, 30,000 I.U. of Serrapeptase per day for 12 to 18 months is sufficient to remove fibrous blockages from constricted coronary arteries, as confirmed in many of his patients by ultrasound examination. The study conducted to determined the positive effect of Exclzyme®EN for reduction of inflammation and painful sensations. In the single blind controlled parallel research 100 patients with inflammatory processes of a traumatic, infectious, post operational and dental origin took part. In research, various dozes of Exclzyme®EN were applied. Effect of Exclzyme®EN on reduction of painful sensations, inflammatory process, side-effects, improvement of blood work results and mobility in relation to control group was observed. 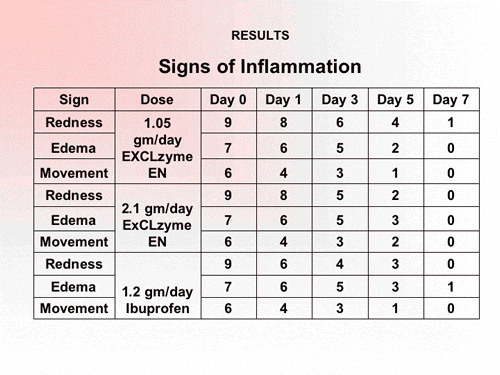 As you can see from the table (pic.2), on the seventh day of the research the patients, who took Exclzyme®EN (daily dose of 2.1 g.) showed, that all signs of inflammation (redness, edema, pain at movement) had disappeared. 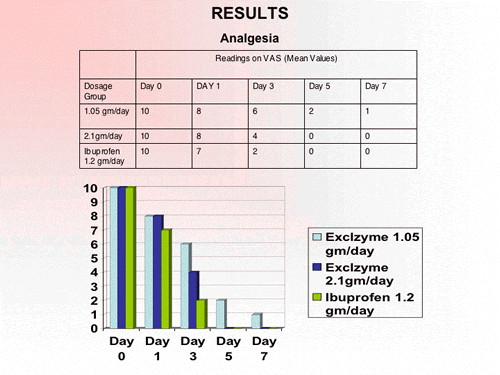 While in the group of patients who took Ibuprofen (1.2 g. a day) there was edema (in one case), and with Exclzyme®EN (1.05 g. per day) – redness (in one case). 1. Carroll A., R.: Clinical examination of an enzymatic anti-inflammatory agent in emergency surgery. Arztl. Praxis 24 (1972), 2307. 2. Celebrex article Wall Street Journal 19 April 1999. 3. No author listed: Regular Use of Pain Relievers Can Have Dangerous Results. Kaleidoscope Interactive News, American Medical Association media briefing. July 24, 1997. 4. Enzymes - A Drug of the Future, Prof. Heinrich Wrba MD and Otto Pecher MD. Published 1993 Eco Med. 5. Kakinumu A. et al. : Regression of fibrinolysis in scalded rats by administration of serrapeptase. Biochem. Pharmacol. 31:2861-2866,1982. 6. Ernst E., Matrai A.: Oral Therapy with proteolytic enzymes for modifying blood rheology. Klin Wschr. 65 (1987), 994. 7. Kunze R., Ransberger K., et at: Humoral immunomodulatory capasity of proteases in immune complex decomposition and formation. First International symposium on combination therapies, Washington, DC, 1991. 8. Kelly, G.S. "Bromelain: A Literature Review and Discussion of Its Therapeutic Applications." Alternative Medicine Review (November 1, 1996). 10. Metzig, C et al Bromelain Proteases reduce human platelet aggregation in vitro, adhesion to bovine endothelial cells and thrombus formation in rat vessels in vivo. In Vivo 13 (1): 7-12 Jan-Feb 1999. 12. Kee W., H. Tan S, L., Lee V. Salmon Y. M.: The treatment of breast engorgement with Serrapeptase: a randomized double blind controlled trial. Singapore Med J. 1989:30(l):48-54. 13. Buck JE, Phillips N. Trial of Chymoral in professional footballers. Br J Clin Pract.1970 Sep;24(9):375-7. 14. Department of Otorhinolaryngology, Mie University School of Medicine, Japan. The effect of an orally administered proteolytic enzyme on the elasticity and viscosity of nasal mucus. Arch Otorhinolaryngol. 1988;244(6):355-9. 15. Mazzone A, et al. : Evaluation of Serratia peptidase in acute or chronic inflammation of otorhinolaryngology pathology: a multicentre, double blind, randomized trial versus placebo. J Int Med Res. 1990; 18(5):379-88. 16. Duskova M, Wald M. Orally administered proteases in aesthetic surgery. Aesthetic Plast Surg. 1999 Jan-Feb;23(1):41-4. 18. Kleine MW, et al. : The intestinal absorption of orally administered hydrolytic enzymes and their effects in the treatment of acute herpes zoster as compared with those of oral acyclovir therapy. Phytomedicine 1995;2:7-15. 19. Kabil SM, Stauder G: Oral enzyme therapy in hepatitis C patients. Int J Tiss React 1997;19:97-8.